Early this month, I attended the 2011 meeting of the Central Division of the American Philosophical Association in Minneapolis. There were several sessions devoted to philosophy of mind, and it occurred to me that it would be appropriate for this blog to report on what the philosophers of mind are up to these days – or, at least, some of it. There are difficulties and limitations of such a project. The presenters intend to be at the cutting edge of philosophical research and they have only 25 minutes to make their case. So, inevitably, the papers at conferences like this one are thick with jargon. The arguments are complex, and they typically assume familiarity with several papers that have been published in recent years. Furthermore, a paper is not likely to be accepted at a conference like this one unless it argues against a view that’s been espoused by at least one respected member of the profession. But there ought to be hope that one could say in plain English what the philosophers who spoke at philosophy of mind sessions were interested in, or what Key Problem they were trying to solve. I think this hope can be fulfilled, and that’s what I’ll try to do in this post. 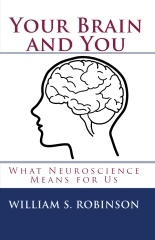 The Key Problem stems from a background view that is widely accepted: Everything we do is brought about by events in the neurons and synapses of our brains, and these neuro-synaptic events are sufficient to account for all our movements. It is neuro-synaptic events that send the impulses that contract our muscles, and the contractions of our muscles constitute our behavior. Reasonable people have dissented from this view, and some of them are living. It’s even possible that some of them were at the Minneapolis conference. But in today’s philosophical climate that is unlikely; and certainly, no one expressed doubt about this background view in discussion. The Key Problem arises because it is very attractive to hold each of three further views. But, on pain of contradiction, you can’t accept the background view and hold all three. The further claims are these. (1) Mental events (for example, thinking of something you believe) are not the same as neuro-synaptic events. (2) Mental events causally contribute to human actions. The commonsensical backing for this one lies in the many everyday remarks that say someone did something because they had a certain belief. “Jane was mean to Susan because she believed Susan was trying to steal her boyfriend.” “John took the longer route because he believed a section of road on the shorter route had been closed for repairs.” “Tom called off the picnic because he believed it was going to rain”. And so on. No one wants to hold that when we say these things, we are speaking falsely or nonsensically. (3) If an event has one sufficient cause, nothing else can cause it – unless that other thing would have caused the event all by itself. This one is a little trickier than the others. To begin at the end, there can sometimes be two sufficient causes of an event, as in a firing squad. Smith’s bullet enters the right side of the traitor’s brain at the same instant that Jones’s bullet enter the left side. Each is a sufficient cause of the traitor’s death, and, importantly, each would have caused the traitor’s death even if the other shooter had missed. But the philosophers who are having the discussion I’m reporting agree that beliefs do not contribute to actions in this way. That is, none of them suppose that a belief could bring about an action even if there had been no neuro-synaptic cause that was sufficient to cause the action. But if there was a neuro-synaptic cause that was sufficient for an action, and a belief is not the same thing as that neuro-synaptic cause (as (1) says), then it seems that there is nothing left for believing to do – no way in which believing could causally come into play. You can’t accept the background view and all three of these statements as they are written. If mental events, such as beliefs, causally contribute to actions (as (2) says), then either they have to be the same as physical events (rejecting (1)) or they can causally contribute even though not the same as a physical event. That will mean rejecting (3), unless mental events can independently cause actions. But that would require giving up either (1) or the background view. Perhaps you will think that one of the three statements is clearly the obvious candidate for abandonment. But it’s likely that the next two people you talk with about this will have a different candidate that seems just as obvious to them. That, at any rate, is how it works among philosophers. In a nutshell: Most contemporary philosophers share a vision according to which all that we do is a product of what happens in our neurons and synapses. But then it seems hard to get beliefs to do any causal work. Yet most want to say that our beliefs do causally contribute to what we do. This entry was posted on Monday, April 25th, 2011 at 8:29 pm and is filed under causation. You can follow any responses to this entry through the RSS 2.0 feed. You can leave a response, or trackback from your own site. I do appreciate this blog for posts without the jargon. Another example of mind’s action on the brain in daily life is a goal-oriented action such as taking a bus to New York say from new Jersey, in order to go to New York. Here the goal achieving action started in the present uses some information pertaining to the future state of being in NY, namely that the goal is NY because taking a bus to any other city does not take one to NY. I think many philosophers (for example Ernest Nagel) argued that this does not mean backward causation. They say – if for example, after going to the bus-stop if for some reason, the scheduled bus is canceled and I do not want wait for the next bus, and I change my mind and come home without taking the bus, in this case, leaving home to go to the bus-stop is caused by the the neural correlate of the goal in my imagination but not by the future state itself. Agreed but how is the neural correlate of the imagined goal created? Nowadays, we have computers solving complex problems. Consider a chess playing program. It can defeat world champions. But for doing so, a programmer has to first enter into it a definition of the goal, and then rules and algorithms and then has to initiate the program to run. The brain, is also a memory and a physical/material system. How does it get information about a possible future state of itself by itself? It seems neuroscientists answer this saying that the brain acquires the information required to create the goal’s neural correlate from its memory of past experiences and from the environment; and similary the information required to create the strategy. Still two questions remain: 1) can a material brain start an action all by itself unlike the computer? Does not the goal-achieving action need to be initiated by an external agent (something other than the brain)? How does the brain label its neural records as past? and future? not merely by two labels but sequentially with regard to time? How does the brain create the time sequence in view of the fact that it does not receive any sensory input to create time as a neural correlate of the input? Are answers to these questions available in any monist theory? I appreciate your response. You raise quite a few juicy questions, and delving into most of them would soon lead us past the boundaries of our knowledge. But I think I can say something helpful, so long as it’s understood that my responses are only sketches, and raise questions of their own. The most important thing is not to be overly impressed with the limited analogies that hold between us and computers. We know in detail how computers achieve their results; we do not know in remotely comparable detail how brains are able to do what they do. We shouldn’t say: Well, they are computers, but problematic ones that need an outside programmer. We should say: they don’t work like IBM’s Watson (even when they solve similar problems) and they don’t need a programmer. The neural structures that enable brains to do what they do arrived through variation and natural selection. You rightly mention the role of learning and memory. Let’s add that a lot of what we learn concerns causes and effects, groups of things or events that are usually found together, how processes usually develop, and what usually happens when we act upon things. It is this knowledge of usual sequences that enables us to imagine likely future outcomes, both in nature (the treeless riverbank on the outside of the curve will continue to erode) and in our actions (the shell will break if we hit the egg with a fork). Can a material brain start an action all by itself? Remember that as long as we’re alive, the brain is always running. Always; even when we’re asleep. It gets plenty of input from our sense organs. What the brain does is take in present stimulations, process them, and produce output. It does this always. The output that it’s ok to keep on just sitting where I am, daydreaming, reading, mulling over a problem, or whatever is just as much a result of brain processing as reacting to seeing that it’s 7:30 on the clock and hastily rising from the breakfast table to catch the bus for work.